As many genealogical researchers know, tracing your ancestors in major metropolitan areas can prove difficult, thanks to the use of similar names, confusing address patterns, and, often, changing locations. In New York City, residents changed addresses rather frequently, making it challenging to place them in any one location for an extended period. Interestingly, residents in New York City often relocated around the same time each year due to a long-standing tradition, Moving Day. Moving Day was a tradition in New York City that began in colonial times and continued up through the end of World War II. Every year, landlords would give their tenants notice of the new rent prices for the following quarter on 1 February, also known as Rent Day. City residents who intended to move would spend the spring days with good weather searching the city for a new home. On 1 May, all leases in the city expired, so all residents then moved to their new homes at the same time, creating chaos in the streets. During the last two weeks in April of each year the cartmen begin to put on a few extra airs, and look and act with the more importance than at any other time during the year. Everybody then calls him Mr. Cartman, and when the first of May arrives then ‘stand from under!’ He then becomes very domineering, and everybody feels that it is their interest, if not their duty, to bow and cringe to him, for on that day of all the year it is generally admitted that a cartman may charge any price that he pleases. 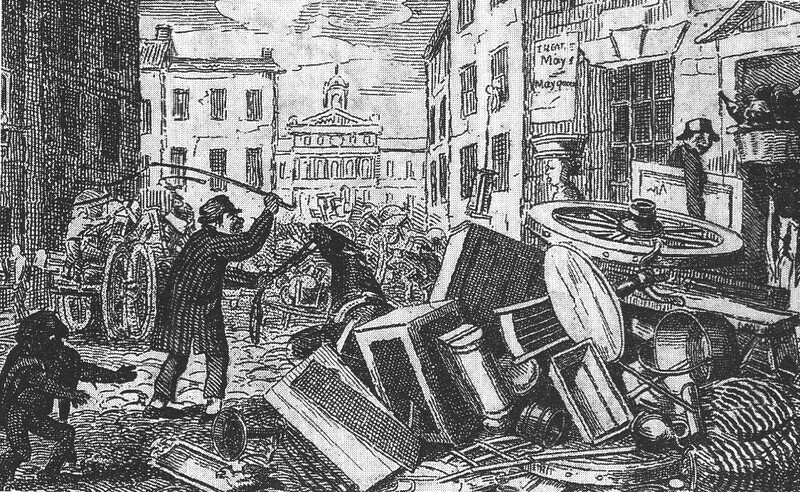 Often, the relocation of tenants was not a matter of choice, but of necessity, as historian Edwin G. Burrows notes: “in a tight, impersonal, and utterly unregulated housing market, where landlords pressed to maximize rent, tenants outbid by competitive renters were compelled to move.” Citizens were not only faced with increasing rents intended to drive them out of their homes, but also with the high rates charged by the cartmen, causing some individuals to spend as much as a week’s wages for the right to utilize a moving cart. While the city often set the rates which the cartmen were permitted to charge, these regulations were sometimes ignored. If payment was not received at the time of the delivery of the customer’s possessions, the cart operator had the right to bring the load directly to the police station and to charge an extra fee for this delivery. 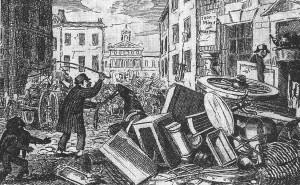 While many families still relocated on 1 May, as early as 1856 some landlords became more relaxed in their policies, allowing tenants to move in a few days early or late, creating more of a ‘moving week.’ By the time the Depression of 1873 ended in the spring of 1879, more housing was being constructed and prices began to drop, leading to a decreased need for families to relocate on a yearly basis. Another element of the changing culture of New York City which affected the Moving Day tradition was the suburban relocation of many residents in the summer months. 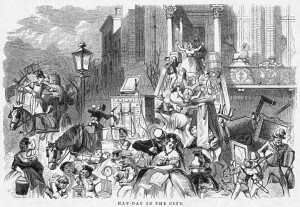 In many cases, residents of New York City would remove to cooler suburbs of the city during the hottest months of the year, returning to newly rented homes at the end of the season, and, as a result, 1 October became the new de facto Moving Day for many city dwellers. Despite these changes, it was estimated that in the early twentieth century as many as one million residents changed residences at the same time. While there was a resistance to the annual tradition in the 1920s and 1930s, it was not until the beginning of World War II, when able-bodied men who could be used as movers were in short supply, that the practice came to an end. While the tradition of Moving Day is all but a distant memory to most New Yorkers, it was an important yearly event which played a significant role in how researchers trace their ancestors who lived in the city before World War II. “Facetious Landlords,” New York Times, 13 February 1854, http://query.nytimes.com/mem/archive-free/pdf?_r=1&res=9A0CEFDD103AE334BC4B52DFB466838F649FDE. “May Day. 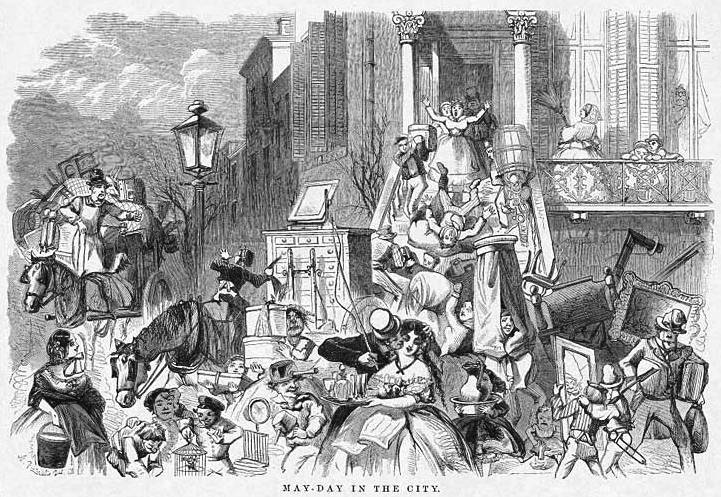 A History of ‘Moving Day’: Its Pleasures in the Past and Miseries in the Present,” New York Times, 30 April 1873, http://query.nytimes.com/mem/archive-free/pdf?res=9505E7D7163DE43BBC4850DFB2668388669FDE. “Letter,” New York Times, 2 May 1856, http://www.baruch.cuny.edu/library/alumni/online_exhibits/digital/2007/moving_day/images/007_lg.gif. Isaac S. Lyon, Recollections of An Old Cartman [Old New York Street Life], introduction by Graham Hodges (New York, 1984), p. 4, http://www.baruch.cuny.edu/library/alumni/online_exhibits/digital/2007/moving_day/page003.html. Edwin G. Burrows, Gotham: A History of New York City of 1898 (New York: Oxford University Press, 1998), p. 392. Alexsandr Gelfand, CUNY, “Moving Day Exhibit,” http://www.baruch.cuny.edu/library/alumni/online_exhibits/digital/2007/moving_day/images/015_lg.gif. “What it Costs to Move,” New York Times, 29 April 1890, p. 5, http://www.baruch.cuny.edu/library/alumni/online_exhibits/digital/2007/moving_day/images/015_lg.gif. 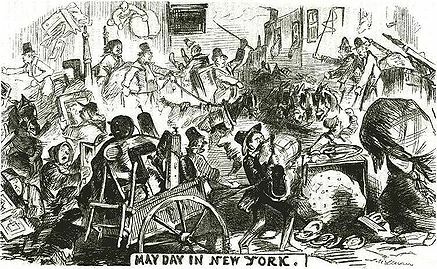 “First of May-Moving Day,” New York Times, 1 May 1855, http://query.nytimes.com/mem/archive-free/pdf?res=950DE7DF103DE034BC4953DFB366838E649FDE. “Moving Day” in Encyclopedia of New York City, edited by Kenneth T. Jackson (New Haven, Conn.: Yale University Press, 1991). Gelfand, “Moving Day Exhibit,” http://www.baruch.cuny.edu/library/alumni/online_exhibits/digital/2007/moving_day/page001.html. Interesting! Were there other major cities that did this? Boston? Boston kinda still does…..with Sept 1 being a big moving day, especially for students. movers will tell you that period is insane…. Been there, done that. Twice as a student. Anyone living in a college town can tell you that moving day still exists. When the spring semester ends and students are either graduating and leaving town or moving their stuff to their fall apartments, the streets and sidewalks can get very clogged. I remember as a grad student watching other students go through piles of discarded furniture looking for items that they could use in their new places. Wow, Karen- your comment is quite a blast from my past. At some universities, a keg of beer was required to get friends to help one move- many of our ancestors surely would have appreciated that! And thanks for the interesting post, Zachary. I have ancestors that lived in NYC in the 1840s and others there in the 1880s-1890s, all living in the poor parts of town. This does explain the frequent moves, and why they just ‘disappear’ from expected records at times. How interesting. I’ve never heard of this practice before. This article fits my family to a T…..from about 1860-1910 several generations moved around the west side of Manhattan, staying within a narrow range of streets but often on the move. I always assumed it was related to either rent increases or the poor condition of the tenements. Thanks for a great article. This practice was not limited to New York City; May and September were and still are the time when people tend to move in the Chicago area. What a fascinating article on a subject new to me, as I have no 19th c. NYC ancestors. I love the cartoons you found for illustrations. As a former resident of several college towns, I too saw, and participated in, this phenomenon in neighborhoods around the universities there. Thank you, Zack, for this blog post because it really lit up my day! Tom Tryniski’s free newspaper database, fultonhistory.com, contained plenty of articles about the May 1 “Moving Day” in many other New York cities, and in other states as well. I learned that it sometimes caused a problem with Arbor Day celebrations as well as for schools and their students. For years, I have wondered why my maternal grandparents, natives of Syracuse, had changed addresses so often. Moving day provides a plausible explanation for why they HAD to move. May Day. — We hope that this day of bustle and confusion may be clear, dry and brilliant, much to the safety and satisfaction of all good housewives, who will be up to their ears in cobwebs, dust, mops, brushes and frying pans. — this moving on May Day, we owe to our honest Dutch ancestors — peace to their remainders. It did well enough when the city of New-York was bounded by Wall-street, and St. Paul’s was out of town. Laws and customs must change, and be made to suit the times.